I read Italo Calvino’s Invisible Cities only a few months before coming to Darran Anderson’s Imaginary Cities, which Anderson describes in a footnote as a ‘diminished non-fiction mirror’ to Calvino’s classic work. I think Anderson’s a little over-modest here: although he doesn’t have Calvino’s great economy (Imaginary Cities clocks in at 570 pages to Calvino’s 148) what he’s done is something of profound originality all the same. We’re used to new books about architecture and the urban space. Writers like Owen Hatherley and Anna Minton looked at what successive rulers did to the modern city. But it’s when that caustic perception is allied with a staggering historical memory and the imagination of an Iain M Banks or a Kim Stanley Robinson that one becomes hopelessly lost. Anderson is an ex contributing editor to 3:AM magazine. I say this not just by way of disclaimer (having written there myself) but because it part explains Anderson’s extraordinary range of reference. He’s inspired by SF, utopian fiction, dystopian fiction, detective fiction, comic books, video games, French romance, brutalism, magical realism, the flâneur, the golem, Dante, Swift, Rushdie, Tintin and de Sade. He travels widely in time and space. Lost cities. Sky cities. Underground cities. Moving cities. Cities that come out of tubes. Cities that change according to one’s mood. 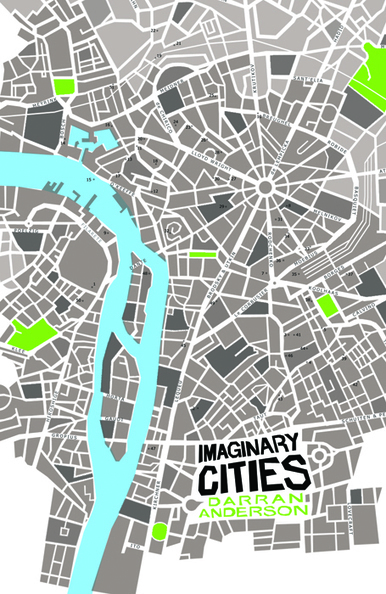 Imaginary Cities is 3:AM in book form. Ruins have a remarkable capacity for reinvention. In its (after-) life the Parthenon has been a church, a mosque, a battered hideout against Venetians (who blew its 300 defenders to pieces), the palace of a Duke (complete with a now-lost Frankish tower), a place of execution and target practice for Turks. It has been dedicated, and rededicated to, and ransacked by, waves of empires and gods that no longer exist in any meaningful sense. It strikes me that at least in the UK we live in a time where the city has barely got started. It has only been a couple of hundred years since we put down the plow and walked to the nearest conurbation. Contra the nimby doomsayers, most of our land is barely developed, while in overcrowded London the super rich extend their mansions into the underground. Who knows what the city will look like in another 200 years, and how it will adapt to a changing world? As I write floods pile into the Calder Valley. Anderson has a new take on climate change: he imagines how the urban will respond if the worst comes to pass. ‘It’s worth considering whether the sunken cities might become modernised. Will the sound of bells be joined by phones ringing, car alarms, the glow of neon in the depths?’ In a recent interview with the Irish Times, Anderson said that ‘For the past twenty years, every time I go to a new city, I keep a notebook of thoughts and the things I see and experience there, very often on night-walks’. There’s something good and comforting about the thought of Anderson wandering and thinking through the night. ‘It is easy to be beautiful; it is difficult to appear so,’ writes Frank O’Hara in his seminal poem ‘Meditations in an Emergency’. But for adman Don Draper appearing beautiful is the easy part. He’s characterised by discreet wealth, immaculate suits, a rich basso voice and perfect hair. Although through the ten years of Mad Men time frame, Don becomes a lot more vulnerable and compromised, physically he barely seems to age or change – he’s like a Comte de Saint Germain for the K-Mart era. Also like the legendary Count, he’s a great wanderer. While his firm negotiate a life-altering buyout, he takes off on an impromptu tour of the west coast, the itinerary including a bizarre sybaritic revel with some European aristocrats. TV critics tied themselves in knots trying to explain who Don is and what motivates him. Like the narrator of ‘Meditations’, Don is indiscriminate but fleeting, entirely specific and disloyal. He’s not a legacy builder like Frank Underwood or Walter White – Don knows that all empires fall. He knows impermanence, and it’s the only thing he really commits to. ‘I’m living like there’s no tomorrow, because there isn’t one,’ he says. When a beatnik acquaintance slags his corporate lifestyle, Don replies that ‘I hate to break it to you, but there is no big lie. There is no system. The universe is indifferent.’ He claims to have never written anything over 250 words – you hope he lived long enough for Twitter. He has to be strong armed into signing even an extended employment contract, so acute is his determination not to be pinned down. He lives only by the ‘hobo code’ – siguls scratched by wandering men on barns and gateposts to advise and communicate: beware of the dog, this farmer will give you work, a dishonest man lives here. When Don Callahan failed to kill the vampire in Salem’s Lot, Stephen King sent him roaming down strange roads – the ‘highways in hiding’, in King’s lovely phrase – into dozens of alternate Americas, different in subtle fractures and gradations. Don Draper would have loved Callahan, and called him father. Pascal said that all human evil comes from an inability to sit still in a room. ‘I am always looking away,’ Frank O’Hara writes, ‘Or again at something after it has given me up. It makes me restless and that makes me unhappy, but I cannot keep them still.’ If Don Draper is evil – ‘a pretty dismal, despicable guy’ as actor Jon Hamm put it – he’s that kind of evil, the evil that comes from a reluctance to take responsibility for anything. (‘You only like the beginnings of things,’ a furious ex declares.) After accidentally killing his CO during the Korean war, Draper steals both the officer’s identity and his Purple Heart. A dustbowl farm boy who spent his childhood in a bordello, Don confiscates the life of a respectable American male. And he assumes that what works for him works for everyone. Tracked down by his true half-brother Adam, Don simply pays the kid to go away: the brother is broken by the rejection and hangs himself. When his colleague Lane Pryce is caught out in a cheque fraud, Don counsels him to plan an ‘elegant exit’. The exit is not so elegant: Pryce’s bloated corpse is found the next day, swaying from the office doorframe, again death by hanging. Still Don believes that the only way is to ‘get out of here and move forward.’ When his protégé Peggy has a breakdown he visits her and says: ‘This never happened. It will shock you how much it never happened.’ As my Twitter pal Jason Lee Sandford pointed out, she’s the only one to survive his advice. Sixteen out of the twenty-eight were in analysis or analytical psychotherapy. Eighteen were taking tranquillisers; several had tried suicide and some had been hospitalised for varying periods, for depression or vaguely diagnosed psychotic states. (‘You’d be surprised at the number of these happy suburban wives who simply go beserk one night, and run shrieking through the street without any clothes on,’ said the local doctor, not psychiatrist, who had been called in, in such emergencies.) Of the women who breastfed their babies, one had continued desperately until the child was so undernourished that her doctor had intervened by force. Twelve were engaged in extramarital affairs in fact or in fantasy. Betty Draper’s is the life of people who don’t get to run away. Showrunner Matt Weiner doesn’t give her a break even in the final season, where she is diagnosed with terminal lung cancer. In a final cruel irony, the doctor addresses her husband throughout when he gives this evil prognosis, even though Betty’s in the room at the time. (Even Walter White’s doctor gave his death sentence to his face.) Having given the impression throughout of a mother who is continually irritated and embarrassed by her children, Betty writes to her college daughter Sally to tell her that ‘I always worried about you because you marched to the beat of your own drum, but now I know that’s good. Because your life will be an adventure.’ It’s a scene that reminded me of Wee-Bey handing over guardianship of his son, in The Wire – the caged bird setting free its young – and it strikes me how much of Mad Men is about chronology, and how it impacts on our lives, as the UK’s jilted generation know. This device isn’t a spaceship, it’s a time machine. It goes backwards, forwards. It takes us to a place, where we ache to go again. It’s not called ‘The Wheel’. Its called ‘The Carousel’. It lets us travel in a way a child travels. Round and round, and then back home again. To a place where we know we are loved. That, I think, it’s why there’s not much discussion of the civil rights movements in the show – James Meek complains that ‘The Mad Men writers raise the ghost of racism without giving it the substance to kick us in the gut.’ There’s truth in what he says. But history is not personal stories constructed around a series of headlines. People are active in their personal dramas far more than they are witnesses to wider change. When Dr King comes on the car radio, Don turns him over not because he’s racist but because he’s not interested and wants to chat up the woman he’s giving a lift to. Much has been made of the glamour of the show, perhaps because critics of the 2010s envy characters of a world without so much ludicrous moralising around drinking and smoking. 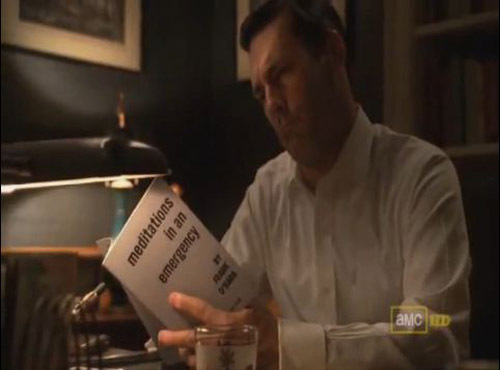 But the glamour of Mad Men is also spectral – after all, most of these characters would be dead by now. Everyone has ghosts. The ghosts of the past. The ghosts of the roads not taken and the ghosts of lives that could have been lived. The ending to series two, set during the Cuban Missile Crisis, has a special eeriness because we came so close to making a phantom of the planet. Under the dentist’s anaesthesia, Don sees a ghost of his younger brother Adam: at the end of another drinking session he has a vision of his best female friend, Anna Draper, at the moment of her death. In this vision she picks up a suitcase and walks, smiling, into whatever comes next – perhaps into those highways in hiding. In a 2001 forward to The Shining, Stephen King asks: ‘For aren’t memories the true ghosts of our lives?’ and truly they are like ghosts – unquiet, unreliable, indiscriminate but fleeting, entirely specific and disloyal. In the Guardian piece Faber makes several big assertions. Despite opening a dialogue with Cameron – by writing to him – Faber assumes that ‘the likes of Cameron are not interested in what individuals have to say’, says that the UK has no ‘political class of wisdom and grace’ and also comments upon ‘the sheer indifference that our rulers have to what we might wish and what might actually be the wise and humane thing to do.’ It’s a big statement to make because politicians, although not that interested in individuals, are not such monsters as Faber appears to think – no, seriously, they’re not. The parliamentary debate on Syrian airstrikes featured plenty of doubt and angst from both sides. MPs agonised over the motion because no one likes the idea of blood on their hands. We are governed by human beings. At least we have to behave as if politicians are not always indifferent, or as if they can be shaken from an indifference. Otherwise, why vote? Why campaign for change? I’m actually sympathetic to his argument here. Beware implementing what David Allen Green calls the Something Must Be Done Act. I am very uneasy about the use of airstrikes, because of the obvious risk to civilian life. Most people would feel the same. But it is surely the case that doing nothing is also an active choice – and that there’s also an arrogance, and a fantasia, to doing nothing. Faber’s characterisation of Syria as ‘a country that we don’t understand in the least’ strikes me as bizarre in an information age where we can learn more about the Middle East than ever before. You can meet Syrian refugees in any large city, you can talk to the Syrian opposition, go on their websites and find out what they think about the airstrikes and many other things. The agora is open as never before. But this opposition barely figured in the UK debate beyond the gleeful mockery of Cameron’s 70,000 moderate fighters figure, which STWUK are trying to spin into his ’45 minutes from doom’ soundbite. No one was trying to imagine what it would be like living in an ISIS controlled area, or whether the people living there were really so different to ourselves. Hostility to inward migration and to foreign intervention has grown in the UK at the same time and for the same reason. It’s all so complicated, we’re going to get bogged down and it will cost a lot of money. Easier to turn off the news, close our borders and forget none of this bloodshed and horror is even happening in the world. That attitude got us a refugee crisis that threatened to engulf Europe. As Lenny Henry used to say on Comic Relief: Forget geography. These are your neighbours. And Faber’s belief that airstrikes will attract terrorism to the UK (‘dropping more bombs on Syria is only going to strengthen their resolve’) is intuitive but wrong: the UK exports terror these days. Our cocksure middle-class men slip over the Turkish border to cause havoc and devastation in poor countries. Writers and artists tend to take the far left, anti war position on these things. Critiquing Faber’s words seemed almost pointless – I kept thinking to myself, he’s a distinguished novelist, he’s obviously going to have these beliefs, and his tone of precious ennui, ersatz world-weariness and macabre irony is of a piece with that. Most of the poets, writers, performance artists and radical publishing people I know think the same. I think that, again, it’s a matter of intuition, that creative people believe that they need to take these reflexive positions, as if not to do so could compromise their creative selves. Maybe I’m wrong, but it would explain why they seem so damn sure of themselves – it’s been said before that all the laser-eyed raging certainty in this debate came not from the warmongers but the men and women who said they were all about peace and humanity and virtue. This is a shame because although Faber is maybe right that literature can’t change what happens in the world, I think creative people have potentially a lot of insight and value to put into these debates. I would like, at some point, to have that kind of conversation.